Fisher Farms Gourmet Baked Rellenong Bangus - Healthy and Hassle-Free! - All Chucked Up! 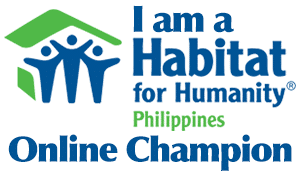 You are Here >> Home >> Events >> Fisher Farms Gourmet Baked Rellenong Bangus – Healthy and Hassle-Free! Fisher Farms Gourmet Baked Rellenong Bangus – Healthy and Hassle-Free! I love milkfish (commonly known as Bangus here in the Philippines). No matter what kind of way this flavorful fish is prepared, I always look forward to it. Not only is Bangus versatile… it is also incredibly healthy. This fish used to be part of my strict diet when I was on my rigorous weight loss and fitness program wherein I dropped 50 lbs. 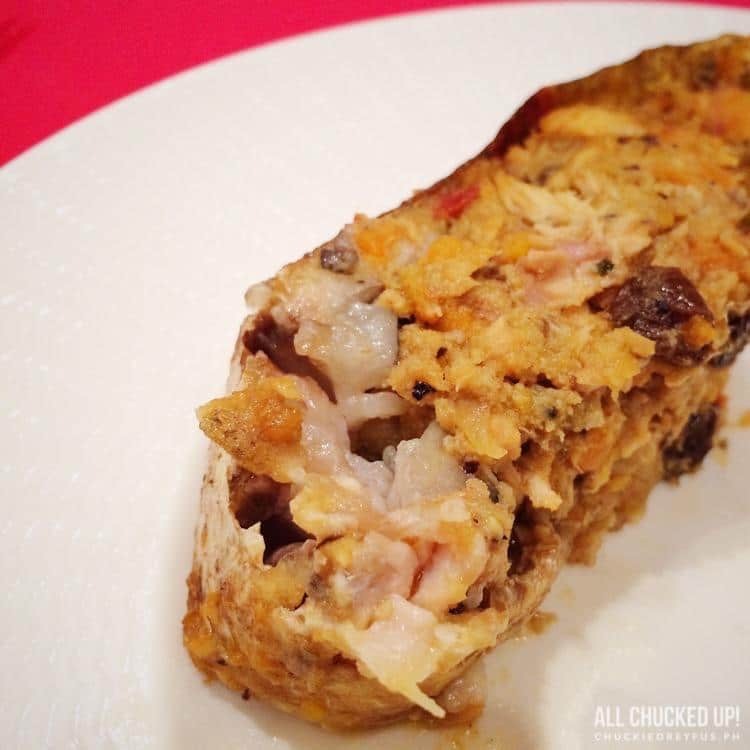 One amazing way Bangus is popularly prepared is “relleno” style. And it is just as show-stopping and ahhh-inducing as perhaps a lechon or a leg of ham on the dining table. 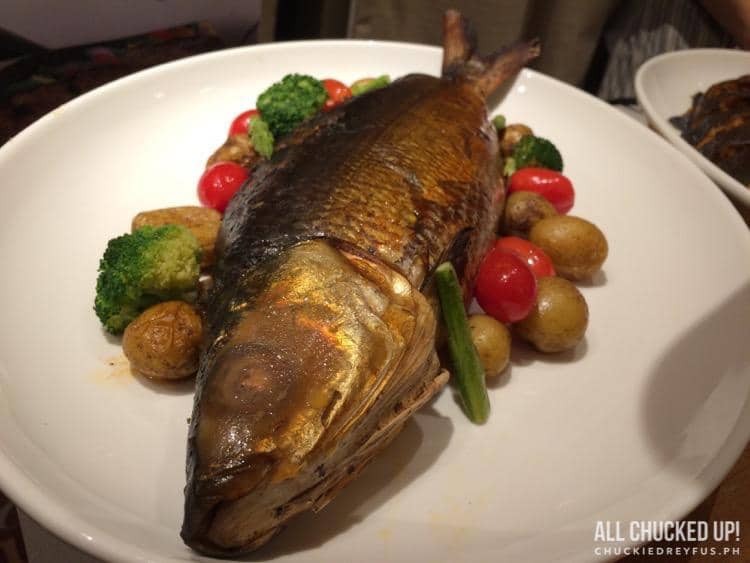 Apart from that, with Rellenong Bangus, you don’t consume as many calories as when you indulge in fatty dishes. Now, that is something well worth considering. 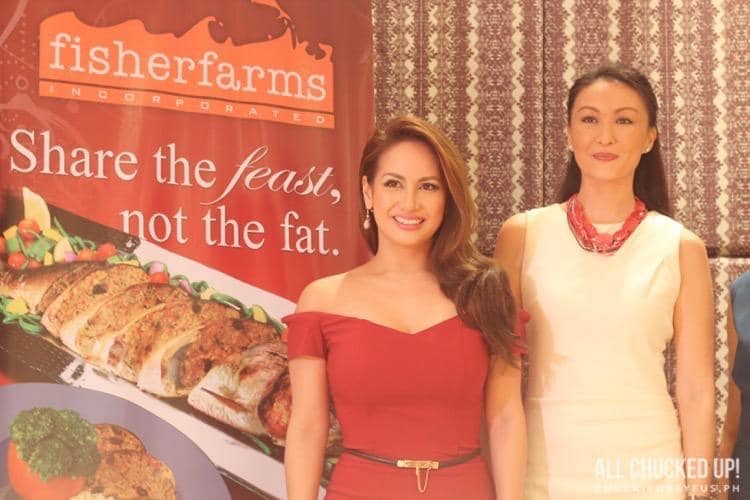 So, when I was invited by the good folks of Fisher Farms to witness the launch of their newest product – the Fisher Farms Gourmet Baked Rellenong Bangus – I knew that I just had to be there and to experience how an already delicious and well-loved dish can become more flavorful and endearing. 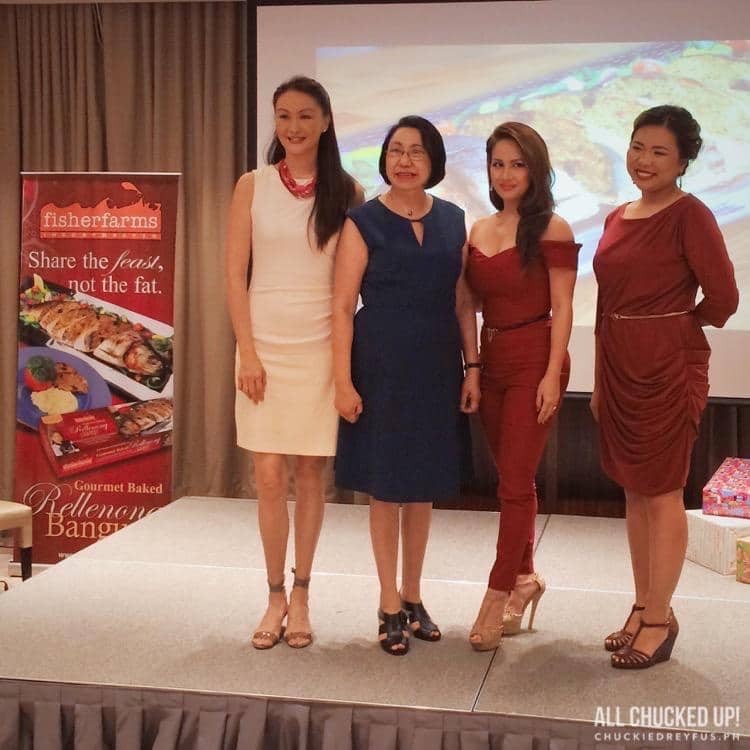 During the beautiful launch at the Marco Polo Hotel, we were treated to a short program which featured two healthy and fit celebrity moms… Regine Tolentino and Marina Benipayo. On stage, they shared their love for staying healthy and how they try to find ways and means to always provide healthy food for their respective families. Being a health buff myself, I enjoyed how they shared their love for fitness and eating clean. I also especially loved their friendly banter and interaction with guests. 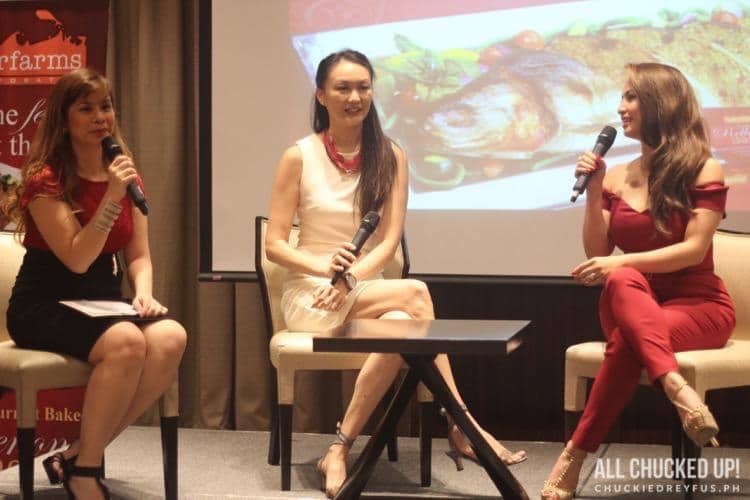 It was also during this short program that they introduced the creator of Fisher Farms Gourmet Baked Rellenong Bangus – celebrity chef and food expert, Reggie Aspiras. She explained that this delicious creation is a healthy alternative to the usual fatty dishes often seen on the Noche Buena table. Fisher Farms Gourmet Baked Rellenong Bangus is stuffed with a savory filling of fish, sweet potato, bangus belly, shrimp and other premium and special ingredients giving your traditional relleno a delightful holiday twist. Apart from it’s obvious health benefits, this dish is juicy and flavorful unlike its fried counterparts that sometimes have a cloying aftertaste. Also, unlike traditional rellenong bangus, Fisher Farms Gourmet Baked Rellenong Bangus is (as the name implies) baked and not fried, which cuts down considerably on the fat content without sacrificing flavor. 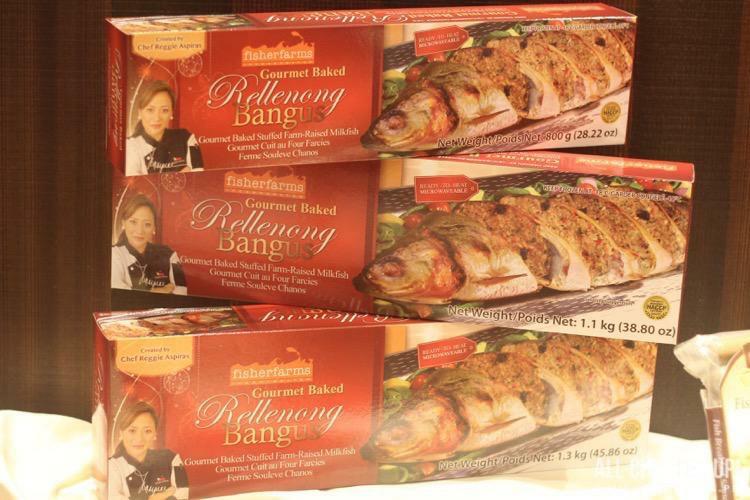 Their Gourmet Rellenong Bangus comes in three sizes to suit any Filipino family: 800-grams, 1.1 kilos, and 1.3 kilos. And hey, let’s face it… making your own Rellenong Bangus takes time and tedious work. Why work up a sweat when you can simply open a box of Fisher Farms Gourmet Baked Rellenong Bangus, toss it in the oven (or microwave) and have at it! Healthy. Hassle-free. Happy! But why stop there, when you can enjoy other incredible Fisher Farms products which are just as healthy as they are enjoyable to eat! Fisher Farms also offers a variety of wonderful fish products such as Bangus Lemon Butter (482g), Fish Hungarian Sausage (310g), All-Natural Fish Frankfurter (1Kg), Fish Nuggets (200g), Gourmet Selections Roasted Garlic Milkfish Loins (400g) and Smoked Deboned Milkfish (400g). My wife actually used Fisher Farms’ Fish Frankfurter just recently to create what she fondly calls her very own “Fisher Farms Fish Frankfurter Garlic Pasta”! Yum! As the country’s leading aquaculture processor and exporter, Fisher Farms grows its milkfish in the pristine seawaters of Pangasinan in fish cages, resulting to sweeter, more flavorful, firmer and cleaner fish. Only high-protein feeds are given to farmed fish to produce high-quality fish meat. Fisher Farms Gourmet Baked Rellenong Bangus is available in select supermarkets in Metro Manila and in select provinces around the country. Thank you, Fisher Farms, for coming up with great new ways to enjoy old classics and encouraging people to be more health conscious by showing everyone that nutritious and delicious can indeed go hand in hand. Truly… now we can share the feast but not the fat! For more details about Fisher Farms, visit fisherfarms.ph or visit their Facebook page. Follow them on Twitter (@fisherfarmsph) and Instagram (@fisherfarmsph). ‹ Spotify Holiday Playlists – Get into the Christmas spirit! › TeleTech opens its 17th site in Cubao… Check out their new facility!